I recently listened to a Freakonomics podcast that looked at this question: Does money really buy elections? The podcast came out just after Mitt Romney won big in the New Hampshire primary, and the focus was on what the candidates are doing for the next primary, this one in South Carolina. The strategy – raise more money to support campaign efforts. Does the candidate who raises the most money always win? Turns out the answer might be yes, but that doesn’t mean that raising the most money causes the win. Instead, the two are merely correlated. 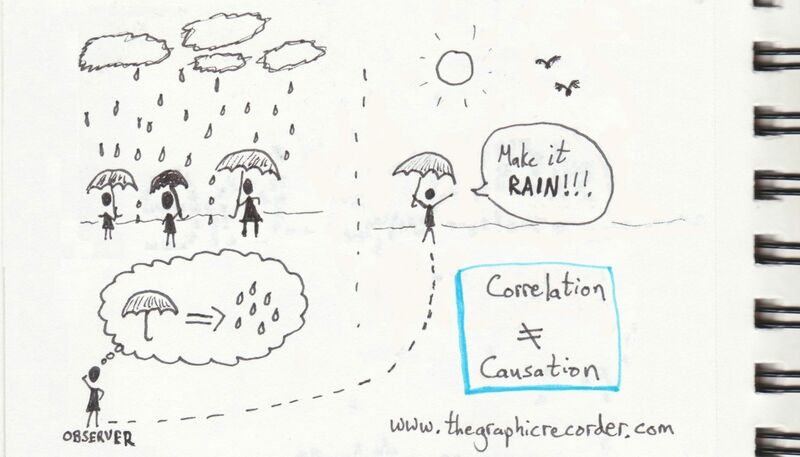 While explaining the relationship between correlation and causation, they gave a simple example, which I have depicted in the graphic above. The gist – just because rain and umbrellas are almost always found together (i.e., they are correlated), that does not mean that the umbrellas are causing the rain. So, correlation ≠ causation. The umbrellas are not causing the rain! What a discovery, right? Though it is unlikely that anyone would actually pose that idea, it is easy to forget that correlation is not the same as causation. In fact, politicians are particularly likely to equate the two, especially when trying to justify their stance on an issue. I’m going to be listening closely over the next few weeks to try to bring in some current examples. If you happen to hear any, then feel free to post them in the comment section below.